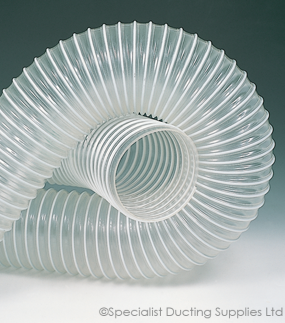 A semi rigid high impact PVC helix encapsulated in clear polyether polyurethane. Clear with a grey helix. 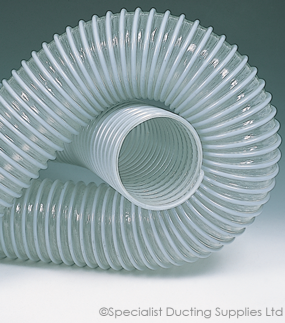 20 Metre lengths up to and including 150mm diameter. 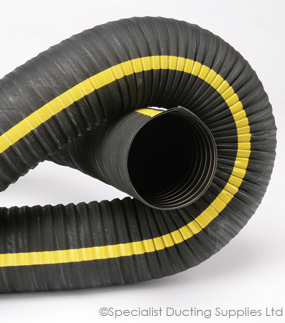 10 Metre lengths from 160mm to 200mm diameter. -30°C to +80°C in a 20°C ambient. Suction and transportation of abrasive materials in a wide range of industries..
FDA approved, high abrasion resistance and smooth bore. PUR Anti-static – Additional external braided copper wire.